The story going into the game was how the Penguins needed to beat the New York Rangers in regulation to have a realistic chance of competing for 2nd place in the Metropolitan Division. The story coming out of the game will surely be Henrik Lundqvist's antics. Lundqvist was taken out by teammate Ryan McDonagh in the 2nd period and lost his stick in the corner. Perhaps believing it was an uncalled penalty on a Penguins player taking him out, he responded on the next rush for the Penguins by turning around and shoving the net off its moorings. While it didn't cost the Rangers on the ensuing PP, the Pens managed to score 3 goals in 1:39 at the tail end of the 2nd to propel them to a 4-1 victory over the Rangers. Sidney Crosby, Evgeni Malkin, Patric Hornqvist, and Phil Kessel scored for Pittsburgh. It's almost impossible to recap this game without talking mostly about what Lundqvist did, and how the Hockey Gods quickly struck him down. The 1st period featured fast paced, back and forth action, and at times the rushes were up and down the ice almost as frequently as they are in the new 3-on-3 overtime format. 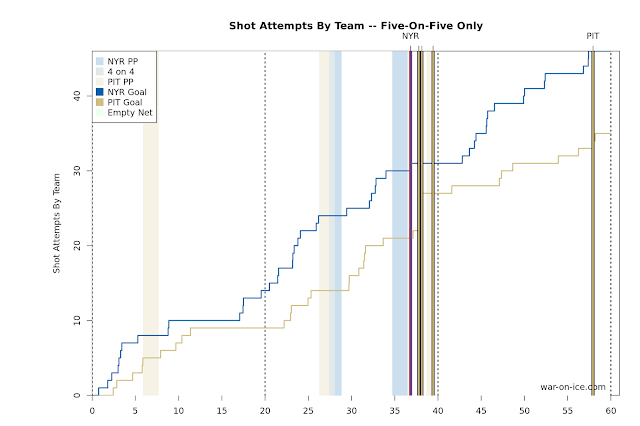 But despite the pace, there weren't as many quality scoring chances as might've been expected. A pair of big hits, one on either side, began to set the tone for what was to come. Dylan McIlrath destroyed Tom Kuhnhackl in front of the New York bench earlier in the period, while Ian Cole slammed Victor Stalberg into the boards coming through the neutral zone later in the period. The score would remain tied entering the 1st intermission, and it would remain that in 2nd when the fireworks started going off. The Ryan McDonagh-Henrik Lundqvist collision was a violent one. Lundqvist had come out of his net to cut off the angle on Patric Hornqvist, and McDonagh couldn't avoid his goaltender and took him out with a high hit that left the goalie sprawled to the ice and his stick in the corner. The play went the other way but quickly came back before Lundqvist could retrieve his stick. The play came back the other way on a 2-on-2, and the stickless Lundqvist turned around and shoved the net to the boards. It was a disgusting display of unsportsmanlike conduct by a player who is no stranger to acting his way to get calls the other way. When he didn't get the call in this case, he took the unprecedented step of stopping play to pout. It was 2 minutes for delay of game, and it should have been 2 minutes for unsportsmanlike conduct as well. The Penguins weren't able to make him pay on the power play as Phil Kessel got called for slashing midway through the opportunity. The teams played 4-on-4, the Pens killed off the shortened New York power play, and the game appeared to be settling into a low scoring affair where a team would need to grind out a goal, maybe two, to take it down. No team was able to grab the upper hand, but a Sidney Crosby holding penalty with just over 5 minutes left would prove to be a turning point. The Rangers didn't score a goal with the man advantage, but seconds after the penalty expired Chris Kreider wristed a shot past Marc-Andre Fleury to make it 1-0. It appeared to be a back-breaking goal for a team that hadn't been able to beat Lundqvist in nearly 5 periods on the season, but the Hockey Gods had other plans for the game. A minute after the Rangers' goal, Sidney Crosby took a shot that hit the outside of the post, bounced back off the boards, and shot directly back towards the post. Crosby was able to knock the rebound back into Lundqvist's skates, and the puck slid back into the net to tie the score at 1. 25 seconds later, it was Evgeni Malkin giving the Penguins the lead. A Trevor Daley shot didn't make it to the net, instead hitting off Dan Girardi's leg and bouncing directly to Malkin's stick. He buried the shot past Lundqvist in a sequence almost as quick as the two Pittsburgh goals. And when Keith Yandle took an interference penalty moments later, the Pens were able to put the game away. With 34 seconds left in the period, Hornqvist managed to redirect a Kessel shot-pass over Lundqvist's shoulder to give the Pens a commanding 3-1 lead entering the second intermission. Lundqvist wouldn't come out for the 3rd period as the Rangers said he was suffering from neck spasms, and the Rangers really couldn't muster much of a challenge in the final period. A Kessel empty net goal sealed the deal. For the first time in a long time, the Penguins were badly beaten in the possession game as they only managed a score-adjusted 43.4 CF% against the Rangers. But the Pens were able to flip the script and came out on top anyways, an outcome they've been on the opposite side of far too often this season. It gave Pittsburgh a much needed two points, and it results in a 4 points swing as the Rangers miss out on points as well. The win brings the Pens to 6 points behind the Rangers for 2nd place with a game in hand and two remaining against New York. Pittsburgh have another great chance to rack up two points when they take on the Calgary Flames who are currently in last place in the Western Conference.